But God, being rich in mercy, because of the great love with which He loved us, even when we were dead in our trespasses, made us alive together with Christ--by grace you have been saved--and raised us up with Him and seated us with Him in the heavenly places in Christ Jesus, so that in the coming ages He might show the immeasurable riches of His grace in kindness toward us in Christ Jesus. Through Grace, God gives life, hope, and certainty in a world of death, anguish, and suspicion. Here we gather to receive grace--the free gift of God that transforms sinners into saints. We are called and gathered by the Gospel, enlightened with God's gifts, sanctified and kept in the one true faith. We teach and confess that Christianity is not a set of beliefs or rules but rather it is the very life and salvation God gives in and through Jesus Christ. We believe that the Holy Spirit gave the thoughts and words to His chosen writers, who wrote both the Old and New Testaments contained in the Holy Bible (this is called "verbal inspiration"). This makes the Holy Bible the very Word of God, which is without error (this is called "inerrancy"). The Holy Bible then is the sole rule and norm of Christian faith and life. In the Holy Bible, God reveals Himself as both one and three. He is one God in three distinct persons--the Father, the Son, and the Holy Spirit (this is called "the Trinity"). All three persons are fully God: coequal and coeternal. Yet these three persons are distinct: the Father sent His only Son, the Son was crucified for our sins and raised from the dead, the Holy Spirit spoke through the prophets. Jesus of Nazareth is the only Son of the Father. He is true God, begotten of His Father from eternity, and also true Man, born of His mother the virgin Mary. He is our Lord, who has redeemed us, lost and condemned people, purchased and won us from all sins, from death, and from the power of the devil. He paid not with gold and silver, but with His holy, precious blood and with His innocent suffering and death, so that we might live in Him now on earth and then into all eternity. The Gospel is the proclamation that Jesus died for all our sins on the cross and rose again in victory so that we might live. Jesus' death and resurrection are historical events that have eternal impact. What kind of worship services does Grace have? Our services are scriptural--practically every line of our services is drawn directly from the Bible, for it is God's Word alone that can bring peace and comfort in this world. They do not conform to the pattern of this world but rather to Christ and the Gospel. Our services are also liturgical, following the rites of the (Western) Church--this means our services are very similar to many other traditional denominations. We call it the Divine Service. Most see worship as offering sacrifice and praise to God--us coming to God and serving Him. We believe that God comes to us and serves us in the Divine Service--the divine God serves us with His gifts, teaching us His Word, forgiving our sins through His ministers, and caring for our souls with His Sacraments. In joyful response, we offer praise and adoration for His grace outpoured on us. 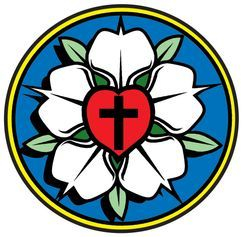 We believe that the confessions of the Lutheran Church are the best and clearest exposition of the Holy Bible. We agree with them because they agree with the Bible. They focus on Christ and His cross, on our justification by grace through faith in Jesus. Also, the confessions share in the same faith that the Church has confessed at all times and in all places--meaning that we believe the same faith as Abraham, Isaac, and Jacob, Peter and Paul, and all Christians throughout the ages and into eternity. The Lutheran Confessions are contained in the Book of Concord of 1580. They include the Apostles', Nicene, and Athanasian Creeds; the Unaltered Augsburg Confession and its Apology (or, Defense); the Smalcald Articles (and the Power and Primacy of the Pope); the Small and Large Catechisms of Dr. Martin Luther, and the Formula of Concord. In holding to these confessions, we are a confessing church. What does it mean to be a "confessing church"? To be a confessing church means that we tell people what we believe and who we believe in. We are sure and certain about what we believe, teach, and confess--boldly witnessing Christ to Muncie and the Ball State University community, East Central Indiana, and the world. All we confess is to have Christ at the center and to be solely drawn from the Holy Bible.